Researchers have unearthed the very first baby snake fossil in history — and it’s teaching us a lot about how snakes’ biology and ecological role evolved. 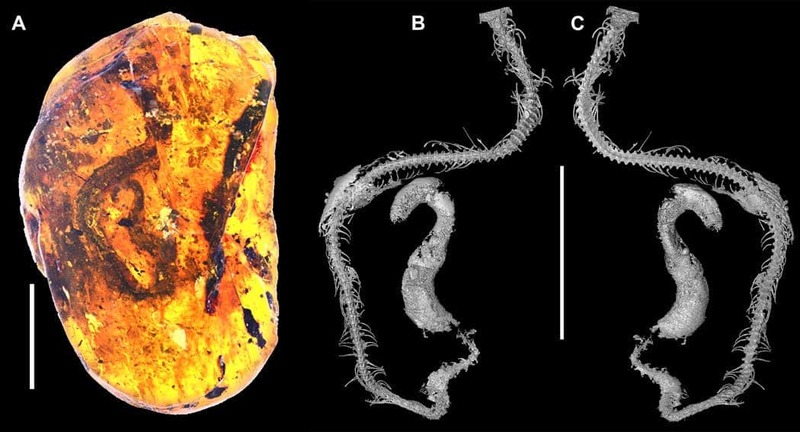 Scientists digging through the Angbamo site in the Kachin Province, Myanmar, have unearthed a 99 million-year-old baby snake, beautifully encased in amber. The fossil, dating back to the Late Cretaceous period, is the oldest baby snake fossil ever found to date, and the first snake we know of that lived in a forest. The small Southeast Asian country of Myanmar is a known treasure trove of fossils. The area previously yielded the tail of a feathered dinosaur, their ticks, as well as a baby frog, all encased in the beautiful amber that the region is famed for. But Myanmar’s soil has yet to reveal all its treasures, judging by a recent discovery — that of a baby snake, similarly preserved in fossilized tree sap. Alongside this, the researchers also found a second snake fossil (also encased in amber) likely containing part of the shed skin of another, much larger snake. It is unclear so far if the two are members of the same species. Snakes today are a very successful group. They’ve spread across all continents except Antarctica, and number roughly 2,900 different species. However, they weren’t always so pervasive; they only emerged on dry land during the Cretaceous period. The new fossil shows us that by around 99 million years ago, snakes had found their way from swamps or sea shores to become fully-terrestrial in forested environments. The second fossil only consists of skin and scale fragments, but are still distinctly snake-like, its discoverers report. This second fossil shows dark and light patterns of coloration and likely formed from the remains of an older, larger individual. Both are extremely similar to snake species living today, a testament to how well-adapted little these little, slithering predators are to their ecological niche. Using uranium-lead dating, a research team led by Lida Xing from the China University of Geosciences and Michael Caldwell from the University of Alberta dated the fossils to about 99 million years old. A technique called synchrotron x-ray micro–computed tomography allowed the researchers to get a close look at the tiny specimens inside the amber without having to break them apart. The baby snake was just hatching when it died, the team report. It’s very tiny, at some 47.55 mm (1.8 inches) in length, but for reasons yet unknown it’s missing a head. Still, based on lab imaging, the team was able to document nearly 100 vertebrae, alongside bits of rib and other anatomical features. While very similar to other snakes from the Cretaceous, it’s distinct enough, the team argues, to warrant receiving its own name. They settled on Xiaophis myanmarensis, where “Xiao” is the Chinese word for “dawn,” “ophis” the Greek word for “snake”, and “myanmarensis” for the place of its discovery, Myanmar. Neither of the snakes is significantly different from species today — the earliest direct evidence so far that the biology of snakes has remained relatively unchanged over the last 100-or-so million years. The fossils are further relevant as they’re the earliest evidence of Mesozoic (the larger Era which includes the Cretaceous) snakes living in forests. This indicates “greater ecological diversity among early snakes than previously thought,” the study notes. The link was established by the remnants of insects and plant material found in association with the snake fossils. The paper “A mid-Cretaceous embryonic-to-neonate snake in amber from Myanmar” has been published in the journal Science Advances at http://advances.sciencemag.org/content/4/7/eaat5042. Wow, brilliant. I'm slightly mystified by the reference to it as a fossil, as I had thought fossils were where the soft tissues were replaced by minerals, and that amber specimens were the actual animal tissue sealed in plant sap, but I have to assume the journal knows best.